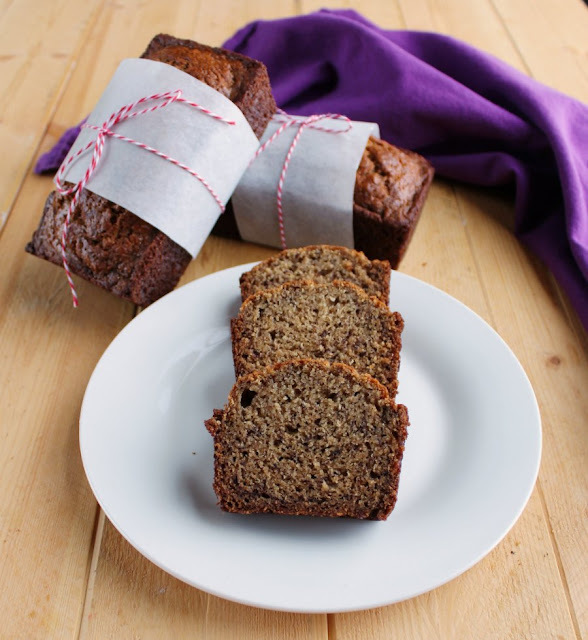 Delicious loaves of banana bread kissed with brown sugar and mixed with the nutty goodness of whole wheat flour. This combination could quickly become your new favorite! It is the end of the Cake Slice Year. So this is the last bake from Maida Heatter's Cakes. I say that with really mixed feelings. I have really enjoyed almost every single thing I've made from the book. I have really enjoyed seeing what everyone else made as well. As much as I love a cookbook with pictures, I have enjoyed the creativity not having something to model you cake after has given us all. But I am REALLLLLLLLLLY looking forward to the new book. I am actually baking my first cake from it as I am typing this. How's that for multi-tasking?! I can't wait to tell you all about it, but I am not allowed to reveal the book until next month. So hold on to your seats! Anyway, the last month of every book is a pick whatever you want bake. Some people might enjoy that freedom, but I really do like having 4 cakes to choose from each month. I am terrible at making a decision and everything always sounds so good. I was really hoping to go out on a big extravagant cake, but life has really been even more hectic than normal here. So, I picked one that was super approachable and used up the ripe bananas I had on hand. Talk about convenience! I love using whole wheat flour where I can, and the bit of nutty flavor it gives along with the brown sugar really made this loaf a delight. Instead of baking one 9" loaf, I baked three minis. Then I sliced them into nice thick slices and packed them up for a camping trip. They were a perfect snack after a long day hiking, canoeing and playing in the creek. A little something to tide everyone over while the fire was being lit and the steaks and potatoes were being cooked. The one big benefit to bake whatever you want from the book month is there could be a lot of variety in what the other bakers make. I cannot wait to see what they all chose. Seeing their cakes will almost certainly add to my list of things I would like to make in the future. I hope you have enjoyed seeing some of the recipes from this book as much as I have. Now just wait until we start the next one! Maida suggests that this loaf tastes even better if you wrap it in plastic wrap and refrigerate it overnight. She also suggests toasting it under a broiler. I just sliced it up once it was cooled and brought it camping with us. Not a single person complained about it just the way it was! Preheat your oven to 350 F and grease a 9" loaf pan (or 3 mini loaf pans). In a small bowl, stir together flours, baking soda, salt and nutmeg. In your mixer, cream butter. Blend in the vanilla, egg and sugar and beat well. Mix together buttermilk and banana in a small bowl. Alternate adding the flour mixture and banana mixture until everything is incorporated. Stir only as much as you need to in order to get it all mixed in. Pour into prepared pan and bake for 50-55 minutes (or 40-45 for the mini loaves) or until it tests done when a toothpick is inserted. Cool in the pan for about 20 minutes and then turn out and cool completely on a wire rack. Now to see what the other bakers baked! 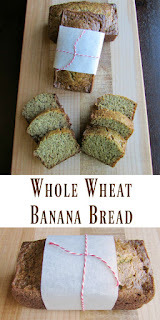 I like using whole wheat flour as well and I bet it's the perfect compliment to the bananas. A little nutmeg in there sounds fantastic! Thanks Andrea! We really enjoyed the flavor and texture of this recipe. It's always fun to try a new banana baked good! This sounds delicious and a good alternative to my go-to banana chocolate chip bread. Mmm, banana chocolate chip bread is good too! This was a fun twist on banana bread, I love trying new versions. I found a honey wheat banana recipe I've made twice, and I love it! This afternoon I found myself wanting to make it again, but it came to a halt because I'm out of eggs. Now reading your post isn't helping my baking itch. Im going to bookmark this recipe for me to make tomorrow! It looks delicious! It is funny how often I find myself baking with bananas. I wouldn't have said it was one of my favorite flavors of cake/bread but judging by the frequency with which I bake with them, I think they must rank up there! I can't wait to try your peanut butter version! I love making mini loaves. The club sounds amazing. Have a great weekend. They are cute and easier to freeze (or gift!) It is a lot of fun... if you want to join you are more than welcome! Have a great weekend, Quinn! I will have to try baking with whole wheat flour Carlee. I love banana bread and this sounds good. Thanks for the recipe to make it. Hope you have a nice weekend. I don't use it in many cakes, but love it in pizza dough, bread and even muffins.Have a great weekend, Julie! I bet this is delicious! I do love the idea of toasting it under a broiler. Must try! Doesn't that sound great? Since ours went to the campground, I didn't have a chance to try it that way. I will definitely have to make it again and give the broiler a try! 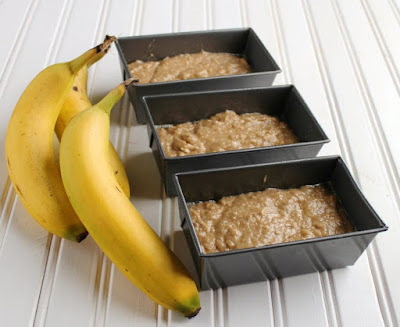 I am always looking for new banana bread recipes, so I am looking forward to trying this one too - it looks amazing. And what great multitasking skills - baking from the new book already as you typed up this one. Looking forward to our big reveal next month! I'm either way ahead or way behind... so I try to shoot for way ahead when possible ;-) I love trying new banana bread recipes too and this one definitely ranked right up there! 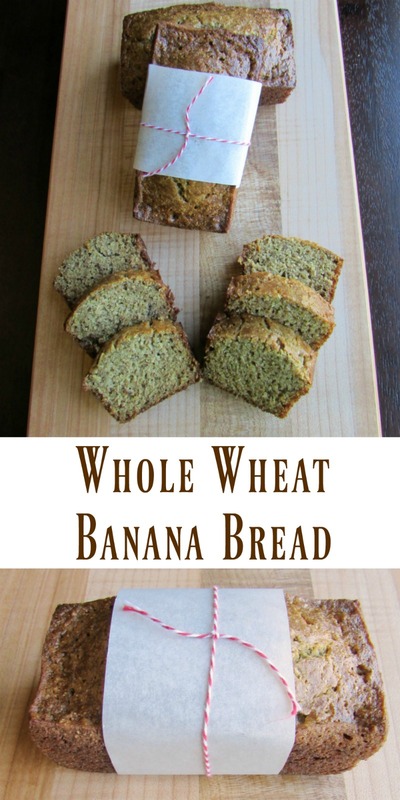 I love that whole wheat is used in this. This sounds like a wonderfully hearty loaf! I had a hard time choosing too but was glad I could pick something simple for this month. It was so good! The banana kept it nice and moist and the brown sugar and whole wheat really gave it that warmth and interest. I have a hard time choosing, so I like having a limited list each month but it was kind of fun to just pick something and go with it! Another wonderful recipe to use up ripe bananas...thank you! Sounds like the ideal snack to take camping. It was a perfect camping snack. Thanks! Your bread turned out really nice. I love a good banana bread. I am so excited for the next cookbook! Thank you! It really did turn out deliciously. I can't wait either, I already baked one cake and it was amazing! 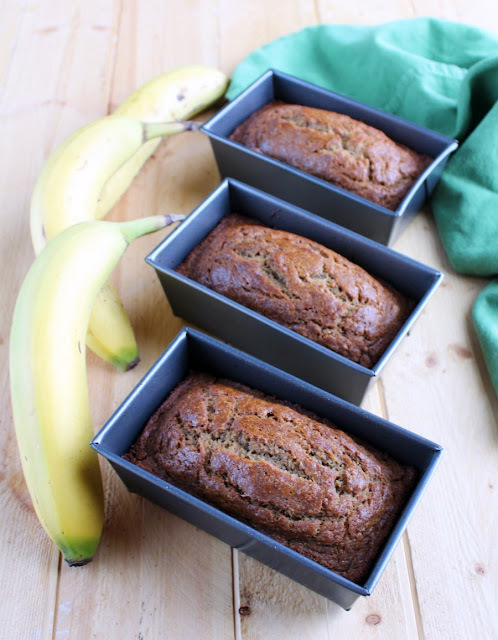 I can never resist banana bread, and yours looks amazing! 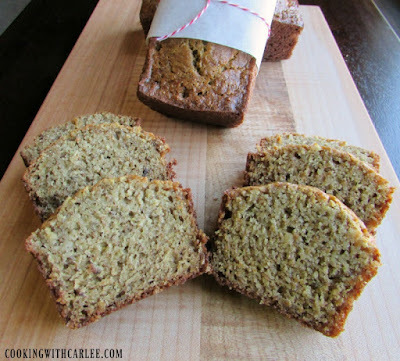 I love trying all kinds of banana bread too, this one is definitely worth making! Thanks, Courtney! Thank you! 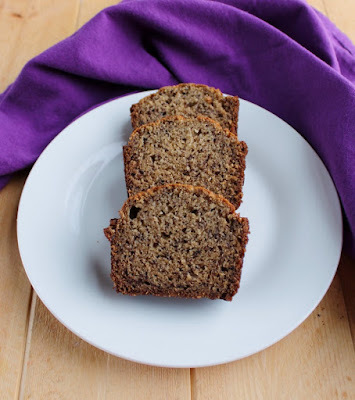 It really is very nice in the banana bread, the flavor and texture were great! I love trying variations of banana bread, this one was really good. Not too sweet and it had a nice warm flavor from the brown sugar and whole wheat. I'll definitely be making it again! Good idea on finishing up my whole wheat flour... now gotta find me some bananas! It's perfect! I can't wait to bake another loaf! I'm woefully behind at getting my most youthful into cooking freely. Not surprisingly - Smarty is exceptionally moving! Super-good! Moist, flavorful, baked in no time! 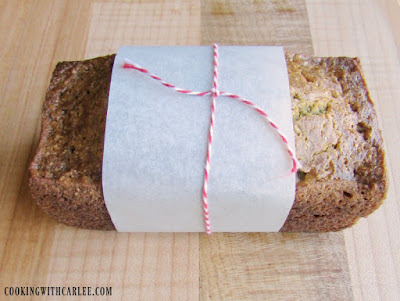 This is my new favorite banana bread recipe and I will be recommending it to friends.